Information in the palm of your hand. TrimView™ login required. Delivery Mode provides ticket, order, status, performance and timing information that is critical to daily operations and efficiency. The delivery timeline and timetable help managers react to inefficiencies quickly and adjust operations as needed. Fleet Mode can be filtered by fleet-wide, from plant, truck or group of trucks to provide analytics and statistics for an overall glimpse of the business - anytime, anywhere. 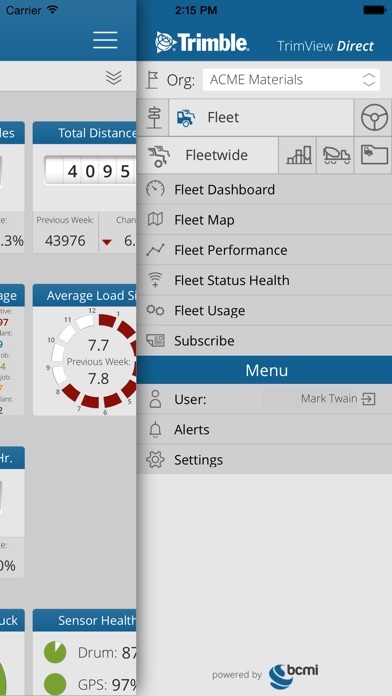 Real-time information and reporting on Fleet Performance, Signal Health, Usage and Truck Timelines help managers make smarter decisions that can reduce costs and improve productivity. Driver Mode delivers information on driver performance including average status times to help evaluate productivity and identify key areas for delivery improvements. Driver hours display road hours, clock hours and mileage for given time period. Find out what is happening in real-time with subscription notifications. Users can subscribe using email or on device alerts for delivery events, truck events, cycle behavior and safety. These real-time updates can be managed by each user for job-critical information at your fingertips. NOTE: To use this app, you must sync your Trimble TrimView office software to the app. Login credentials are required.